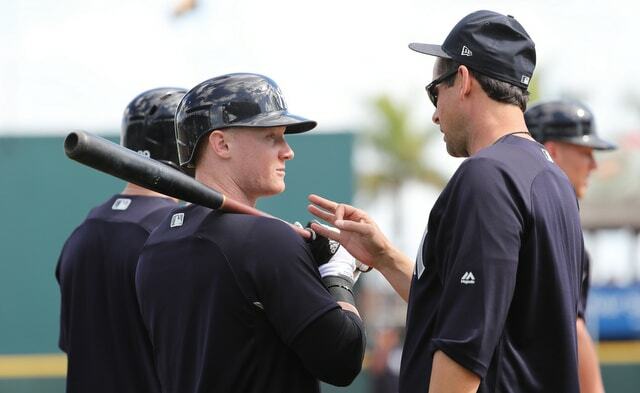 In a somewhat surprising move, the Yankees called Clint Frazier up to the big leagues yesterday, mostly to serve as an extra bench bat in the NL park. He was part of the “the Yankees have too many outfielders” non-problem that sorted itself during Spring Training. It was going to be tough for Frazier to make the Opening Day roster anyway. The concussion took him out of the race completely. In 12 games with Triple-A Scranton the 23-year-old Frazier owns a .362/.423/.703 (218 wRC+) batting line with three home runs, which is obviously great. He recently told Conor Foley he’s been working through some mechanical issues — specifically, his hands have been out of sync with his legs — which isn’t surprising for a guy who missed Spring Training. Frazier feels good though, and he was eager to get back to the big leagues before yesterday’s call-up. Frazier is the fifth outfielder on the roster but he is in the lone outfielder on the bench. Aaron Hicks, Brett Gardner, Aaron Judge, and Giancarlo Stanton are the lineup pretty much every game. If an outfielder were to get hurt, what would Aaron Boone have done before Frazier was brought up? Give up the DH and put Stanton in the outfield? Make Tyler Austin play the outfield? Ronald Torreyes? I’m not sure and I’m glad we didn’t find out. Brian Cashman indicated Frazier’s time with the Yankees could be brief — “We’ll see. Every day, something could affect the decision-making,” said Cashman to Pete Caldera — but now that he’s on the roster, how will Boone use him? Frazier wasn’t in the lineup against Gio Gonzalez last night, so for at least one night this wasn’t a platoon situation. He was on deck to pinch-hit for Masahiro Tanaka when the final out of the fifth inning was made, so there’s that. Judge and Stanton will be in the lineup every single day. That much is clear. That means that, in theory, Frazier could share the other two lineup spots with Gardner and Hicks. It’s a fairly straightforward plan but things are never that simple. Like it or not, the Yankees are committed to Gardner and Hicks, and they’re going to play more often than not. And I agree with that. I think they give the Yankees the best chance to win this season. He just missed two months with a concussion and has only played 16 games since returning. Add in last year’s oblique injury and Frazier has 101 plate appearances over the last nine months. Frazier needs to play. The oblique and concussion robbed him of a lot of playing time — “I’ve never had that much downtime. I feel like I’ve had eight months to prepare for this season,” Frazier said to Sanchez — and while winning at the big league level is always the top priority, Frazier’s development is important to the Yankees as well. Miguel Andujar has a clear path to MLB playing time. Frazier doesn’t. There’s also the “showcase” factor to consider. Frazier is one of the Yankees’ top trade chips, probably their best trade chip among guys they’re actually willing to trade, and letting him rake in Triple-A will probably do more for his trade value than playing sparingly at the MLB level. If there’s an injury and the Yankees can stick Frazier in the lineup everyday — I hope it doesn’t come to this! — great, carry him on the roster. Right now, there’s no spot. Frazier not having a big league lineup spot is truly a first world problem. Ditto Brandon Drury. I think both guys are legitimate Major League players, and yet, I think the best thing for them right now is playing in Triple-A. It’s either that or playing sparingly in the big leagues. Frazier needs at-bats after the oblique and concussion. Drury is still working through his blurry vision problems. The best place to do that is in the minors because they’ll actually, you know, play. Cashman admitted yesterday he likes carrying an eighth reliever (groan) and it seems to me Frazier’s stint with the big league team will be short-lived. He could be back in Triple-A by tomorrow and I don’t think that would be a bad thing, not after the oblique and concussion. In a few weeks the Yankees can reassess the situation, assuming an injury doesn’t press Frazier into action first. Having too many highly talented players is a good thing! And although Frazier is on the MLB roster, there’s no clear cut role for him. A return to Triple-A would be a-okay with me.